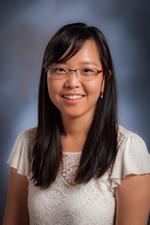 Dr. Jiwon Choi is Staff Accompanist at Northwest Missouri State University, where she collaborates with the university choirs, vocal and instrumental studios, student pianists, music faculty, and guest artists. Born in Busan, South Korea, Jiwon won First Prize of the 2014 American Protégé International Competition of Romantic Music making her debut at the Carnegie Hall. Her performances as a soloist and a collaborative pianist have spanned many venues throughout the United States, South Korea and Italy. She was invited to perform world premiere compositions at the 2013 International Beethoven Festival in Chicago and joined Italian Operatic Experience as a coach in Urbania, Italy. She holds a Doctor of Musical Arts in Piano Performance and Pedagogy from the University of Kansas, where she served as Graduate Teaching Assistantship and faculty member at the University of Kansas Community Music School. She received her Master of Music in Piano Performance at Chicago College of Performing Arts at Roosevelt University and her Bachelor of Music in Piano Performance at Dong-Ah University in South Korea.